Time to sell your Waters at Fairhope home? Read about today's home buyer. Comprised of 95 acres of lush, natural beauty in central Fairhope, Alabama, The Waters at Fairhope is a gorgeous, wooded community that is perfect for nature-lovers who want to escape the noise of big cities without giving up the convenience of close proximity to stores, restaurants, and entertainment. 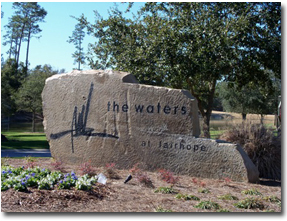 The Waters at Fairhope is located just off Highway 181, north of Highway 104, making travel to other parts of the city or even state easier. A few minutes to the east is Mobile Bay, which is a great place to spend a weekend out on the water. This upscale subdivision is not as crowded as many other neighborhoods and one of the best things about living here is that it maintains the atmosphere of a small town while still being less than half an hour away from Mobile. These houses sit on large lots and the designers were heavily inspired by a variety of architectural styles, such as traditional Southern homes and old-world French country styles. It really is the landscaping at The Waters at Fairhope that make this place unique. With trees everywhere you look, waterfalls, lakes, and twelve different common areas, it’s too easy to pass a whole day taking a nature walk through the neighborhood with the whole family. There is a pier for those who prefer to spend their weekend fishing, but don’t want to stray far from home to do it. Community kayaks and canoes are perfect for paddling out into the small lakes before heading home for a neighborhood barbecue or to enjoy a cup of tea while you watch the sunset. If you would like to schedule a private viewing, need more information, or have questions concerning the Waters at Fairhope or any other property, please email info@condoinvestment.com or call 251.Area.Pro (251-273-2776) for immediate assistance. The Waters at Fairhope is located minutes from restaurants, entertainment, and less than 5 miles from Fairhope's downtown shopping district. It approximately a 30 minute drive for residents commuting to Mobile, AL. The Gulf Coast beaches are roughly one hour from The Waters of Fairhope. Visit our Gulf Shores condos for sale and Orange Beach condos for sale pages to learn more information about investing in beachfront real estate. Condoinvestment.com offers exclusive features including aerial imagery of developments along the Gulf Coast and helpful revenue info for all condos to help investors determine value. We make it quick and easy for users to find properties from Mobile, AL to Panama City, FL with pre-defined search options, interactive maps, and search filters such as price range, property size, and waterfront type.